Tom Holland Updates recently posted a brief interview clip to their Twitter account featuring Amy Pascal and Marvel Studios President Kevin Feige. 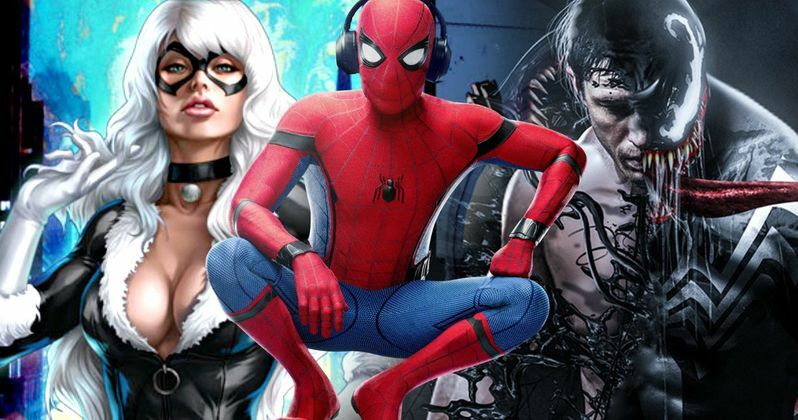 During the interview, Amy Pascal was asked if the Venom movie, as well as the Black Cat and Silver Sable movie, will take place in their own universe or if they will somehow connect to what is currently being done with Tom Holland's Spider-Man. Here's what she had to say about it. "It will all take place in the world we are now creating for Peter Parker. It'll be adjunct to it, it may be different locations, but it will all still be in the same world and they will be connected to each other as well." When she says "they will be connected to each other as well," she is referring to the Sony spin-off movies, just to be clear. She isn't saying that Venom and Spider-Man: Homecoming 2 are going to cross paths. At least not yet. Given her somewhat surprising response to this question, the interviewer asked if we could see Tom Holland's Spider-Man meeting up with Tom Hardy's Venom in some sort of crossover situation at some point. Again, even with Kevin Feige sitting right there to jump in and shoot the idea down, she wouldn't rule it out. "There's always a chance. I think one of the things that Kevin has done with Marvel that was so brilliant is by bringing the fans along and making each movie seem like a chapter in a book. That you have to read that chapter in order to go forward, and I think the investment that fans get to feel in being part of a larger story and understanding what's happening, I think is something that I know Sony would want in everything." Needless to say, this is a huge deal and could wind up having major implications on the Marvel Cinematic Universe. Even though this takes place "adjunct" to Spider-Man: Homecoming, it is in the same world, which means these things are happening within the scope of the MCU. At least as far as we can tell. There is no indication yet that a MCU character other than Spider-Man may swing through a Sony Marvel Universe movie. Kevin Feige and can choose to pretty much ignore any of those events in other SMU movies, but it is very significant. That means Tom Hardy's Venom is going to be the definitive Venom. There won't be another version of that character. This does clean up some questions we had about these spin-off movies, but opens up a whole big can of worms. Currently, Sony's R-rated Venom movie is set to hit theaters on October 5, 2018. Spider-Man: Homecoming is hitting theaters on July 7, which is just around the corner. Maybe Kevin Feige is going to wait and see how these movies turn out? If he likes Sony's take, maybe that will open the door for crossover discussions? It really is hard to say now, but Amy Pascal has officially opened that door and Feige did not feel the need to close it. You can check out the interview clip for yourself below.